It’s a partnership that began back in the early 1970’s, with an album that many now consider to be a landmark, and it’s not surprising that they’ve chosen to commemorate their long relationship by basing their newest collaboration on that classic. New Crystal Silence, just out on the Concord label, is a nicely packaged two-CD set that not only features the performers in new renditions of many of the pieces from the earlier album, but also a ton of extras — all recorded live on their recent 35th anniversary world tour. The first disc is filled with a rich mix of music from the pair’s 2007 appearances with the Sydney Symphony in Australia, and the sound of the duo backed by a full orchestra is something special. There’s little doubt that the melodic interplay of the two stars is still the featured attraction, but the lush backdrop provides an added depth. However, the addition of the large group doesn’t keep the duo from exhibiting their individual improvisational talents and uncanny ability to play off each other. The five tracks on the disc are orchestral versions of some of the pair’s past pieces, including the title song of the original Crystal Silence, and “Duende,” one of Corea’s best-known compositions. Another good track on the disc is the infectiously rhythmic “La Siesta,” a piece that’s also featured (without orchestral backing) on disc two. Speaking of disc two — let’s do just that. It’s content was mostly recorded when the duo appeared in 2007 at the Molde Jazz Festival in Norway, and it’s probably closer to what fans might remember from the original Crystal Silence and similar albums. In other words, two musical artists and long-time friends who demonstrate how well they wordlessly communicate and blend their music. Most of the music is caressingly soft, almost relaxing in a style reminiscent of new age, but a few pieces – especially those with a Latin base – kick up the pace. In addition to “La Fiesta,” such Corea compositions as “Alegria” and “Señor Mouse” give listeners a chance to hear another side of the artists, and it’s well worth the effort. Disc two also includes some jazz standards given the Corea-Burton treatment. 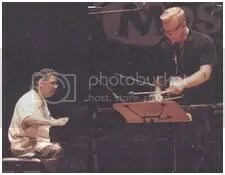 My favorites are probably “Waltz For Debby,” with solos by Corea that I’m sure would have met the approval of composer Bill Evans, and Gershwin’s “I Loves You Porgy.” On that classic, Corea’s soft piano lead creates the mood, Burton has his say, and then the two seamlessly mesh and create magic. An outstanding double album from a legendary duo, and a fitting tribute to their long-standing musical partnership. I saw these two last Friday in Easton, PA. They were amazing. picked up this CD at the show.